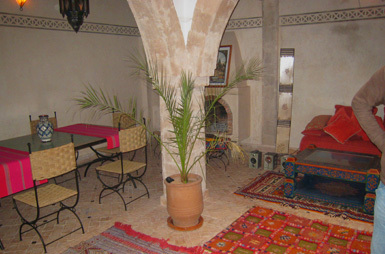 The ground floor consists of a large, open-plan living room and kitchen with a Moroccan fountain. In the kitchen you will find everything you need, from tagines to pots and pans to a juicer and a cafetiere. Cosy up by the fire or have a romantic candlelit meal around the Moroccan tiled table. There is a toilet down here too. Upstairs, on the first floor there is one double bedroom and a second large bedroom with two single beds. As well as a tadelakt (marble-dust walled) shower room, there is a comfortable, bright seating area, ideal for curling up with a book, but also equipped with board games and a TV and DVD player complete with a selection of films for adults and children. Further up on the second floor are two more spacious double bedrooms and a large and luxurious shower room crafted from tadelakt. Finally, on the roof is a small kitchen, equipped for sunny breakfasts or peaceful starlit dinners, and a large red-tiled terrace with table and chairs and sun loungers. On the upper terrace, from which there is a stunning panoramic sea view, there is a small table and chairs, ideal for watching the sun go down with a glass of wine. Other useful equipment includes an iron and ironing board, hairdryer, adaptors and a first aid kit. There is also wireless internet throughout the house. For children we provide stair gates, a high chair, a travel cot with additional mattress and cot bedding and a baby bath. We are also able to organise babysitting during evenings for a small charge. Bed linen and towels are all provided, along with plenty of extra blankets in case you're feeling chilly. We also have beach towels which you are very welcome to take down to the local beach. The house is cleaned weekly and in-between guests and for a small cost you can request additional cleaning and laundry to be done. When you arrive at Dar Ettouahen you can arrange for our housekeeper to cook wonderful traditional Moroccan dinners and breakfasts for a small cost. There is a menu in the house (eg tagines and couscous for dinner; and a selection of bread, pastries, eggs and so on for breakfast) from which you can choose. You do not need to decide in advance what meals you would like - you can decide at the time and discuss this and the timings of the meals when you arrive. In addition we can organise a meal for you on the day of your arrival - all the information will be provided when you book. During your stay, you will be looked after by Fouad, the house caretaker, who is there to make sure you have a great stay. Not only is he able to help with any problems you may have (e.g. finding a doctor), but he can also give lots of advice and organise excursions for you, including transport to the airport or your next destination. He will meet you when you arrive in Essaouira, take you to the house, and lend you a local mobile phone with which you can call him if you need him during your stay. Fouad is kind, honest and very reliable.